Warren G. Popp, 89, of Berrien Springs, passed away Monday morning, January 8, 2018, at his home, surrounded by his children. Warren was born August 27, 1928 in Franklin Park, IL. He married Betty Nussdorfer of Fremont, MI, on January 8, 1950 and they settled in Berrien Springs shortly thereafter. Warren was a general contractor in southwest Michigan. 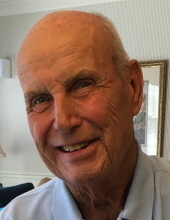 He owned and operated Practical Builders with his longtime partner and friend, Bob Collard, building over five hundred homes in the decades they were in business together. Warren’s greatest joy was to spend time with his family and friends boating, camping, playing games and motorcycle or snowmobile riding. Nothing tickled him more than a good joke and laugh…especially on himself. Warren quit working in his late seventies to care for his beloved Betty who suffered with Alzheimer’s Disease for seven years. After she passed in 2011, Warren found enjoyment playing his tuba in the church band, daily riding his bike six miles and assisting the neighbors by mowing their lawns and helping to split firewood. He maintained his sense of humor right up until the end. Warren is survived by his daughter, Lynda (Bill) Swanson of Orlando, FL; his son, Douglas (Tari) Popp of Berrien Springs, MI; his three grandchildren, Erica Peach and Andrew Swanson of Orlando, FL and Lauren Greene of Traverse City, MI; and five great-grandchildren. Funeral services will be held at 2:30 p.m. on Saturday, January 13 at the Village Seventh-day Adventist Church in Berrien Springs. Online messages for the family may be left at www.allredfuneralhome.com. In lieu of flowers, the family would love to have gifts made to the Village Seventh-day Adventist Church School in Berrien Springs for student scholarships. To send flowers or a remembrance gift to the family of Warren G. Popp, please visit our Tribute Store. "Email Address" would like to share the life celebration of Warren G. Popp. Click on the "link" to go to share a favorite memory or leave a condolence message for the family.